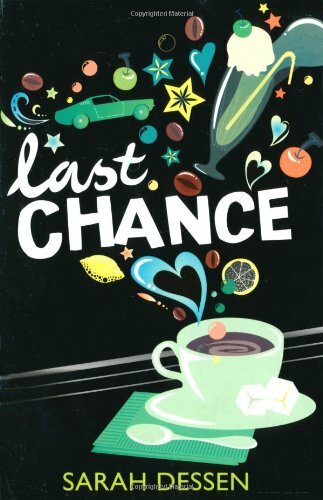 Last Chance by Sarah Dessen – It's Time to Read! I am yet to read a Sarah Dessen book that I dislike – and again, I loved this one. The books are written for teenage girls and often look at the idea of growing up and everything that entails, including self-esteem, friendship and falling in love. This book is no different. Colie has never fitted in at school. For a long time she was overweight, but even when she lost the weight she was still hated. Her mother has become a famous fitness instructor and has to travel over the summer, leaving Colie to stay with her eccentric sister. Her Aunt Mira is artistic and weird, and is often stared at or laughed at. She doesn’t seem to notice or care, but it angers Colie. With the help of the friends she makes at Last Chance, the cafe where she gets work, and Norman, Mira’s lodger, Colie has to work through her self-esteem issues, accept people for how they are, and learn to deal with how others see people. For me, this book is primarily about self-esteem. Mira comes across as crazy and people judge her for that, and Colie was hated and picked on because she was once fat. Mira doesn’t seem to care what others think, but Colie does, and this book works through the pain of accepting how people see you, and liking yourself anyway. I think this is great, as lots of teens do suffer with issues such as self-esteem, and it is really good that this is addressed in a book that is easy to read, sensible and realistic, and really enjoyable. There were other themes in the book, like friendship and love, and I enjoyed reading how Colie come out of her shell and made some real friends. I liked Colie – she had it rough; being concerned about how people saw her and her weight etc, but she was a good kid at heart, and watching her open up was lovely. My favourite character was Aunt Mira however. She made me chuckle, with her eccentric, arty ways, and the little notes on things to remind her what was broken! She was a solid character, secure in who she was, and encouraging to read. This is a really good book. I love Sarah Dessen and recommend her to everyone. Even though this is teen-lit, I really enjoyed it. Top marks from me! I think this book was amazing, and I have to summarize the story for a report on it and this gave me some idea of how to summarize it as well. So thank you.